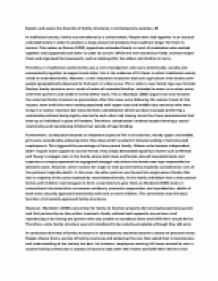 Transfer-Encoding: chunked ﻿Explain and assess the diversity of family structures in contemporary societies. 25 In traditional society, family was considered as a united whole. People were tied together in an classical extended family in order to produce a large amount of products that could last longer for them to survive. 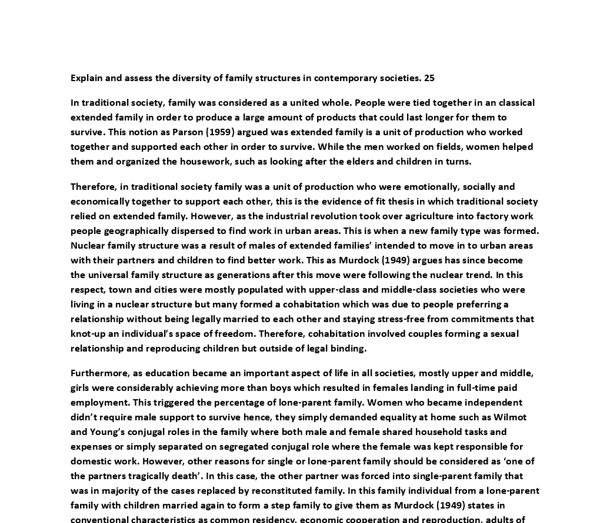 This notion as Parson (1959) argued was extended family is a unit of production who worked together and supported each other in order to survive. While the men worked on fields, women helped them and organized the housework, such as looking after the elders and children in turns. Therefore, in traditional society family was a unit of production who were emotionally, socially and economically together to support each other, this is the evidence of fit thesis in which traditional society relied on extended family. ...read more. Therefore, cohabitation involved couples forming a sexual relationship and reproducing children but outside of legal binding. Furthermore, as education became an important aspect of life in all societies, mostly upper and middle, girls were considerably achieving more than boys which resulted in females landing in full-time paid employment. This triggered the percentage of lone-parent family. Women who became independent didn?t require male support to survive hence, they simply demanded equality at home such as Wilmot and Young?s conjugal roles in the family where both male and female shared household tasks and expenses or simply separated on segregated conjugal role where the female was kept responsible for domestic work. However, other reasons for single or lone-parent family should be considered as ?one of the partners tragically death?. ...read more. Therefore, some family structure was not considered to be socially acceptable although they did exist. In conclusion diversity of family structures in contemporary societies became a choice of personal views. People choose from a variety of family structures and picked up the one that suited their circumstances and understanding of the society the best, for instance, employees working full hours wanted to start a nuclear family so they have a woman in house to look after their home and fulfill their desires of all sorts. However, lone-parent family became a matter of tragedy in many cases as the death of one partner left the other isolated from this particular relationship. Although, many people decided to end their marriage in order to live with freedom. This was mostly decided by women who secured their footsteps in paid work and received recognition for their work. ...read more. During my university classes I have read that traditionally husband and wife are expected to communicate as little as possible here in Japan. This situation is described as a domestic divorce. The Family: Contemporary Issues and Debates. He would often have little or no involvement in the care of his children. In middle and upper class families, children might see relatively little of their parents, often being sent off to boarding schools or being looked after by nannies or au pairs?.